You and your cohorts—family, friends, dictionary editors—compete to create the longest word. What's a seven-letter word for fun? Family, friends, and dictionary editors will have fun finding out with this yard dice game. Roll the oversized dice and try to build the longest word you can from 280,000 potential letter combinations. The player with the longest word of the round gets one point, and the first player to five points wins. 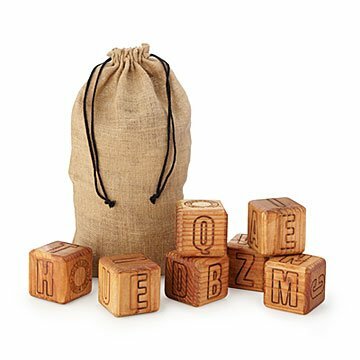 All the pieces stow nicely in a jute fiber drawstring bag, making it easy to bring along to BBQs, tailgates, and spelling bee afterparties. Handmade by Jeremy Exley in Minneapolis, Minnesota. See the Alphabet Yard Dice Game Card. LOVING EVERYTHING! Just looking online and found TREASURE! The items are different and just a wonderful idea! I will update when I receive everything. We have game night at our home. I am the one that brings the coolest items to all occasions for adults & kids to have fun! I can't wait to see the excitement on everyone! !